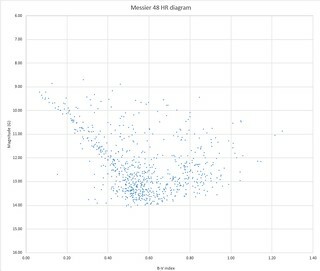 I ran across a forum posting on creating Hertzsprung-Russell diagrams from astrophotos using PixInsight. Since PixInsight is my tool of choice for processing astronomical data, I decided to try it out on one of my image stacks. The process itself is quite straight forward as described. Once images are calibrated, registered and stacked, you simply generate CSV files from V and B channels (green is close to photometric V) using the FWHMEccentricity script in PI. From my image it found 1266 stars for G and 836 for B. 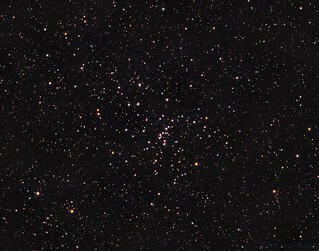 For reference data on actual magnitude you then solve the image and use AnnotateImage to generate a file containing Tycho catalog data on found stars (found 241). Now we have all the datapoints in compatible numeric spaces, so the calculated magnitudes can be fitted with catalog data using a simple linear regression. In Excel you can use VLOOKUP macro to match each star by the calculated Index to match the across the three files. Create separate fits for V (or G) and B, and use the fit function to create yet another column for linearized magnitudes. You can also simplify this by simply using the average offset, if your linear fit is very good and the channel fit slopes nearly identical. 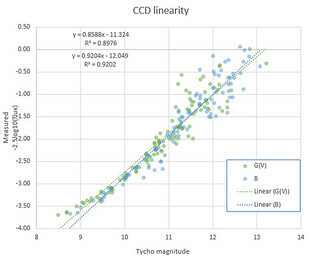 Once you have your calibrated magnitudes from your image data, you can create the final column, "B-V" and use it with V (or G) to create a scatter plot. Put V as the vertical axis and reverse the axis to increase downwards. Clamp the ranges, adjust styles and enjoy your newly generated (pseudo)science. If all goes well, you should be able to see a plot that matches some region of the real star sequence plots. My M48 seems to be a pretty good match on main sequence and sub-giant stars.